12/10/2004 12:15:51 PM Mountain G9:: Howdy y'all........how ya doing? 12/10/2004 11:23:51 AM Mountain mm:: Al, you again lost me: if you bought 90.5 and bailed at -1.25 you must have covered at 89.25 - however, according to eSignal, the market at that time never got lower than 89.50 - ? 12/10/2004 10:16:27 AM Mountain mjs:: News that Dow component General Electric (GE 36.49 +0.47) has authorized a $15 bln buyback program and raised its quarterly dividend to $0.22 from $0.20 has prevented the indices from falling far. 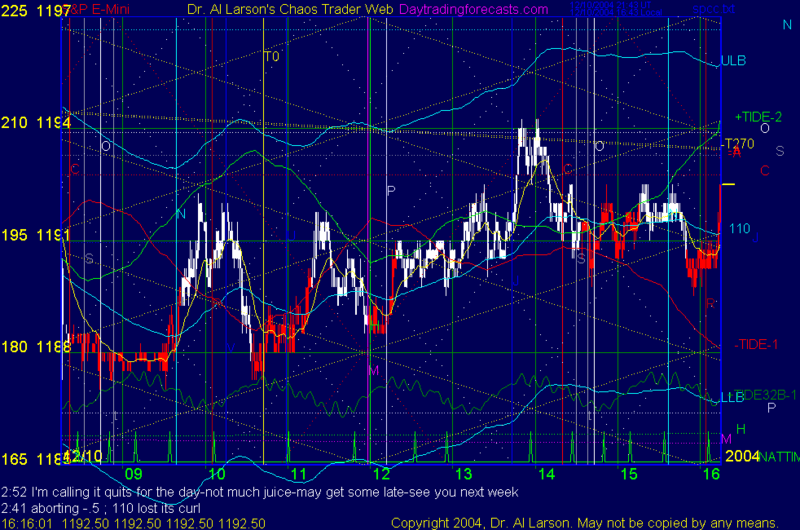 12/10/2004 9:30:45 AM Mountain mjs:: This move confirms (for me) my CC up on low 12/06 and smaller CC dn from 15:30 Yest'd. Lets see what happens. 12/10/2004 9:08:40 AM Mountain mjs:: Last week had a similiar time delay as energy built up. I noticed the corkscrews in the 20EXMA were my best clue as to which way it went. It is saying down now. Just depends on what it hits up ahead. 12/10/2004 9:03:00 AM Mountain mjs:: I'm expecting another downdraft but the traders are not cooperating need stronger moon beams. 12/10/2004 8:51:42 AM Mountain wlj:: afternoon, are you on the other side of the pond ? 12/10/2004 8:40:38 AM Mountain mjs:: OK look like my CC is better than trading news. Of Course it right. Lets see if I can set up the rest of today using it. 12/10/2004 8:36:58 AM Mountain mjs:: That downdraft was just before release of the Mich Consumer Report which came out good. So lets see if there is a continuation trade as news is digested. 12/10/2004 8:28:58 AM Mountain mjs:: I am watching to see which CC I have positioned works best to give me a clue to the rest of the day. MT is long looking for another banana this morning. 12/10/2004 8:13:34 AM Mountain mjs:: It in on the internet now down on my apartment lobby news board. Google away. 12/10/2004 8:12:07 AM Mountain mjs:: For you mathematicians: Someone has posted a picture of Pythagaus original proof of vibrations (ya! in his hand in old greek) along with the original Egyptian rice price caculator. Neat. 12/10/2004 7:11:25 AM Mountain mjs:: Congrads to Gandpa. Harmonics of Catherin the Great. Wow.